Today, we will be creating something that many of us have a hard time buying for – men. I never know what to get my husband and I keep pulling from the same pool of resources each year. I also have brothers that I am a loss for idea for. Most of the time I end up giving them cash… which led me to today’s tutorial. Money! You can use any type of bill that you want. 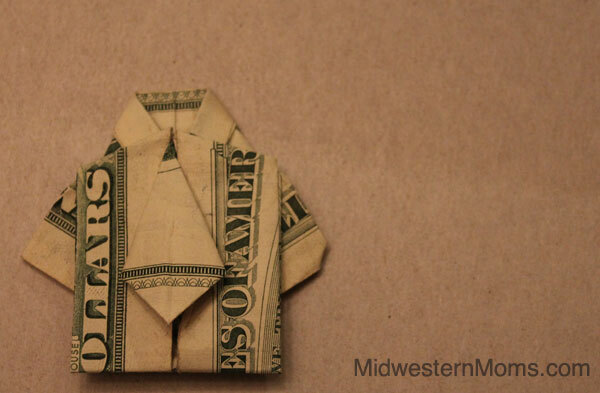 For the instructions for this project, I didn’t want to reinvent the wheel, so I decided to embed the You Tube video I watched to create this dollar bill shirt and tie below. I tried to follow text directions and I didn’t feel like they provided nearly enough explanation and that it is easier to watch it than to read it and try to make the folds. I hope that you enjoy this project and have fun pairing this cash gift with a creative card! Be sure to check out Amber’s keychains made with computer parts on Thrifty Ninja! That is a clever idea! I highly recommend watching You Tube videos to learn! This one helped me understand what to do much better. Good luck!